BEDFORD, MA -- The East Coast Wizards took care of business with a pair of victories this past week over the Connecticut Chiefs and the Walpole Express. With the pair of wins, the Wizards moved their way into 1st place in the South Division of the New England Conference. The Eastern Hockey League (EHL) standings have a slightly altered look this season, due to the removal of the Lehigh Valley Junior Rebels back in November. With the unbalanced number of the games, the order of the standings is being determined by a points percentage (points earned divided by the total number of possible points). Therefore, at 23-11-1 the Wizards would have a First Round bye if the EHL Playoffs began today. "Our guys know the situation, and it's up Kory [Falite] and I to keep the group focused," said Wizards head coach and general manager Freddy Meyer. "We need to control what we can control, and just win hockey games." The Wizards are hoping to do that this week, as they return to Philadelphia for the second time this season. In the first trip south, the Wizards lost a heart-breaking opening game to the Philadelphia Little Flyers, and then dropped back-to-back contests at the hands of the Philadelphia Revolution. 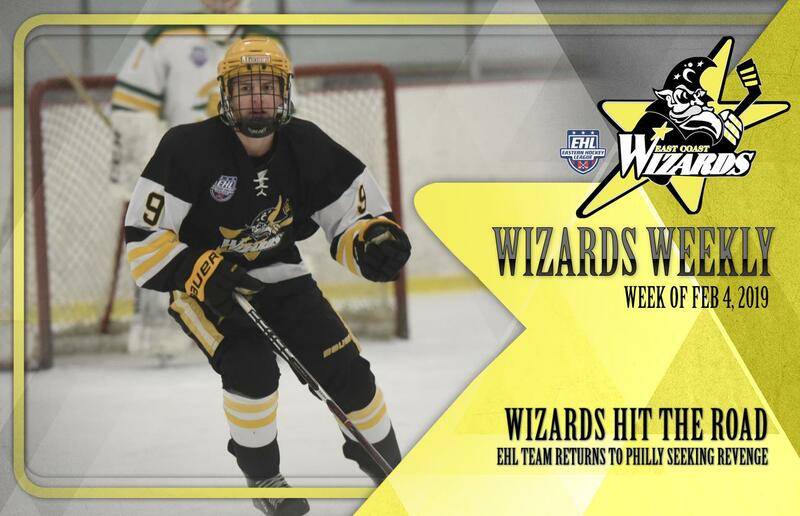 This time around, the Wizards will once again start off with the Little Flyers, and then will wrap things up with a pair of games against the Philadelphia Jr. Flyers. The ultimate goal is to grab all six points, especially with this being the last major trip of the season. Following the three-game stretch, the Wizards will play four of their final six games on home ice at The Edge Sports Center. "We're looking forward to the trip," added Meyer. "After this we only have games left against conference opponents, so every point is key this week."